For Beck’s cover of David Bowie’s “Sound and Vision”, Chris Milk, our interactive music video guru, has decided to just blow out of proportions anything we could have previously related to experiencing a live performance from behind our computer screen. We’re not just talking about the ways Beck decided to go big – aka employing a massive orchestra plus a choir (a total of 167 people we’ve heard), but to the degree of immersion we are subjected to, being able to control camera movements through the simple tilting of our heads. 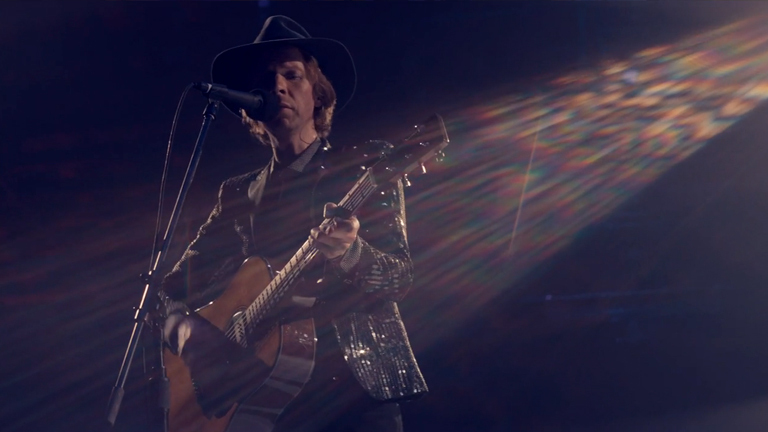 Having three camera positions, each available with 5 filming possibilities, we are allowed to position ourselves pretty much anywhere we would want in the room (including on the stage with Beck! ), hearing what we would “naturally” hear from that spot (Milk literally had to invent a system of microphones that would be able to replicate this natural 360-degree sound). On top of this, from every spot we have a 360-degree available spectrum, thus being able to pan around and see everything around us. Quite an awesome experience we thought (potentially even better from what the people actually seated in the room experienced!) However, if you’re too dazzled about the numerous possibilities this video offers, you can watch the linear version here. Also, if you want to read more about other 360-degree music videos, check out our blog post about them. For Beck’s cover of David Bowie’s “Sound and Vision”, Chris Milk, our interactive music video guru, has decided to just blow out of proportions anything we could have previously related to experiencing a live performance from behind our computer screen. We’re not just talking about the ways Beck decided to go big – aka employing a massive orchestra plus a choir (a total of 167 people we’ve heard), but to the degree of immersion we are subjected to, being able to control camera movements through the simple tilting of our heads. Having three camera positions, each available with 5 filming possibilities, we are allowed to position ourselves pretty much anywhere we would want in the room (including on the stage with Beck! ), hearing what we would “naturally” hear from that spot (Milk literally had to invent a system of microphones that would be able to replicate this natural 360-degree sound). On top of this, from every spot we have a 360-degree available spectrum, thus being able to pan around and see everything around us. However, if you’re too dazzled about the numerous possibilities this video offers, you can watch the linear version here. Also, if you want to read more about other 360-degree music videos, check out our blog post about them.